MR SAMUEL Lee Bai Song took a calculated risk and chose to cast his lot with Singapore University of Technology and Design (SUTD) in 2012 when it first opened its doors to its pioneer batch of students. Now, three years on, the 23-year-old is happy to have taken that leap of faith. In fact, he is so pleased with the way the university's curriculum is structured, he intends to enrol in the Doctor of Philosophy (PhD) programme offered at SUTD. "At that time, joining SUTD was seen as a highly risky move, compared to joining established universities such as the National University of Singapore and Nanyang Technological University. I decided to join the EPD programme because the curriculum was different from what was offered at the other schools and it was exciting to be part of something new," says Mr Lee. In September, he will graduate with a degree in Engineering Product Development (EPD) specialising in the Electrical Engineering track, and will start his PhD studies immediately. Mr Lee was awarded the prestigious SUTD President's Graduate Fellowship, which comes with a monthly stipend and covers full tuition fees for his four-year PhD programme. The scholarship also provides him with an annual allowance he can use for activities related to his education and research at SUTD, covering information technology, books, conference travel for presentation and research attachment. Pursuing his postgraduate studies with SUTD will allow him to continue learning about the research topic he is interested in - electrical engineering, especially in the field of integrated circuit chip design, he says. A special feature of an SUTD education is the "big D" - all students are exposed to inter-disciplinary projects that cut across pillars. "SUTD embraces 'Design' very seriously, with all core subjects requiring students to complete design-oriented projects either individually or in groups," says Mr Lee. " 'Design' is a core aspect of SUTD and probably the factor that has impressed me the most." He loves having the white space to roam and explore. "Often, in these design projects, students are given just a budget and a deadline to execute the project requirements and a class demonstration, which leads to a level of uncertainty and anxiety on the one hand and a level of risk-taking and innovation on the other. "Many students are motivated to not only meet the requirements but even surpass them to show the talent they have. This is particularly outstanding for me," he adds. For his PhD, Mr Lee's research objective is to build a circuit block that is part of a very large system for Visible Light Communication (VLC). VLC is similar to wireless technologies such as Wi-Fi, but uses light in the visible electromagnetic wavelength range produced by LEDs. As a research-intensive university, it is important for SUTD to have a PhD programme, says Associate Professor (EPD) Ricky Ang Lay Kee (below), who helped set up and launch the PhD programme. The university had its first intake of PhD students in September 2013. What is special is that SUTD does not offer degrees in the traditional disciplines. Its PhD programme comprises four pillars, which are aligned to its undergraduate curriculum. Apart from EPD, the other three pillars are Architecture and Sustainable Design (ASD), Engineering Systems and Design (ESD) and Information Systems Technology and Design (ISTD). "To encourage students to have a broader research exposure, we have a unique programme that our PhD students can choose to do a six-month overseas attachment or internship on topics related to their PhD research topics or interests, after passing their PhD qualifying exam. 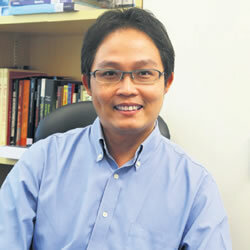 This attachment or internship is officially registered as a specific course to earn official credits," says Prof Ang. Another feature is having project work as part of the course requirement in all pillars. For example, EPD PhD students must complete two one-term projects within the first two years. "The first is to do a project with a faculty member who is not their PhD adviser. For the second, they have to do a project off campus (one to three days a week), which is co-supervised by an external party. This curriculum provides our PhD students with more exposure to industry-related works. We believe this experience will be helpful towards their PhD thesis," adds Prof Ang. SUTD also offers a two-year Dual Masters Programme, which enables students to spend the first year at Massachusetts Institute of Technology to complete coursework and acquire relevant knowledge in their specialised fields. In the second year, the students return to SUTD to conduct full-time research under a faculty adviser. Such a programme provides a holistic learning environment where students are exposed to technical training, allowing them to apply what they have learnt to their research work. Source: The Sunday Times © Singapore Press Holdings Limited. Permission required for reproduction.